One of the most common problems that lawn maintenance professionals are confronted with is what to do about dry spots in lawns, light colored, dry, brown patches. It’s not unusual to hear a customer telling us about a stubborn dry brown patch that they just can’t seem to correct. What to do about dry, hot spots in lawns can be challenging. Often homeowners have tried many different methods to treat the spot but just haven’t hit upon a successful cure. The problem is that sometimes it can take some detective work to determine what is causing the spot. That’s where we come in. We’ve developed expert techniques for determining exactly what is causing those ugly, dry patches in your lawn. 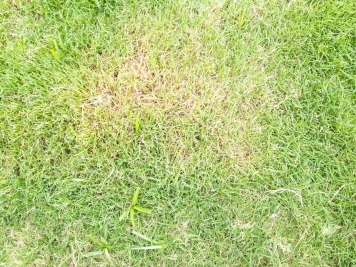 Usually, these patches are a sign that your grass is under some serious stress. If patches are relatively small and isolated, then the family dog may be the culprit. Nitrogen in a dog’s urine is a notorious cause of dry patches. If your dry patches are more widespread, then the problem may be excess nitrogen in a previously applied fertilizer. The problem is only exacerbated when the lawn doesn’t receive enough water. The first thing we do is ensure that your grass is getting the hydration it needs. Typically, this means watering to a soil depth of between one-quarter and one-half an inch every two to four weeks. When we’re getting more rain, you won’t have to water as often, but be cautious if we’re going through a drought. You’ll have to be particularly vigilant about watering during this time. We recommend early morning watering to minimize evaporation and to make the most efficient use of the water. If your lawn has dry patches because of nitrogen burn, then we’ll use a metal rake to lift up some of the grass so we can inspect the roots. It may be that the nitrogen has not burned the roots. In this case, the grass will not have to be replaced and will grow again once it receives adequate hydration. The raked areas will be irrigated to leach away the urine or fertilizer that is causing the dry patch. We may completely or partially replace the turf, depending upon the extent of the damage. Then, we will design a custom fertilization schedule for your lawn so that you don’t have similar problems in the future. If you’re trying to decide what to do about dry hot spots in lawns in your lawn in Colleyville or Euless, then give us a call. We can help you solve this problem with just one or two visits. With our ongoing care of your lawn, your yard will soon be the envy of the neighborhood. Why Use a Professional Lawn Service? Does Your Lawn Have Brown Patch?